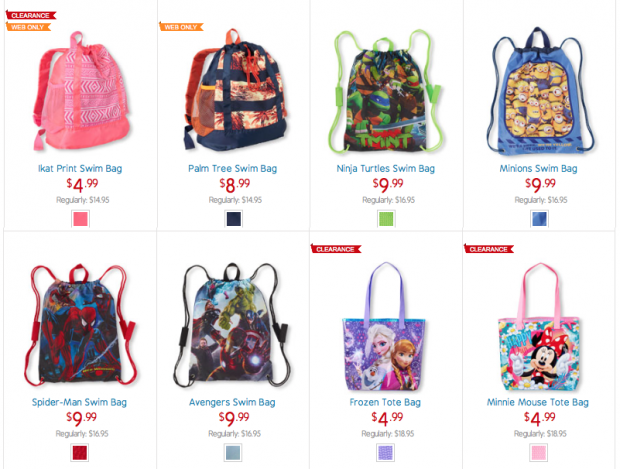 Kids Totes And Swim Bags As Low As $4.99! You are here: Home / Great Deals / Kids Totes And Swim Bags As Low As $4.99! Teach the kids to keep track of their own things on outings this summer! Get them Kids Totes or Swim Bags for As Low As $4.99! Give them a reason to want to gather up their items by enticing them with these super cute bags sized just for them. The Minions Swim Bag for only $9.99 is top on the list with the new Minions movie starting July 10! The Frozen Tote Bag for only $4.99 will be a hit with every little frozen fan!